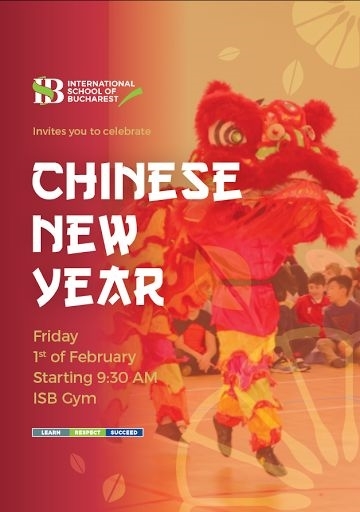 ISB has the honour to invite you to the Chinese New Year Celebration which will take place at the school on Friday, 1st February at 9.30am. Our students will be welcoming you with songs, poems, dances and video presentations of the Chinese Culture. Chinese Martial Arts Association in collaboration with Mr. Fang Shuang prepared a very nice martial arts presentation for us. After the show, we invite you to try the very delicious traditional Chinese dishes in the school's gallery, join the children in the classrooms for a special Tea Ceremony or participate in different workshops held by the Confucius Institute representatives. We hope you will be able to join us on this very popular and traditional event for our school’s community.